abandon: to quit during a race or ride. Ackermann steering: geometric principle for three- and four-wheel vehicles which states that the axis of front steering wheels must intersect the rear axle at the same point. ANSI Z90.4: bicycle helmet safety standard of the American National Standards Institute. agrupado: [Spanish] in racing, the peloton riding in one or more groups. l'americaine: [French] the American; an endurance track race in which teams of two riders relay one another, one in the fray the other resting, usually a massed-start points race, often within a six-day race; named for its American origin at Madison Square Garden in 1890s; also madison. arc-en-ciel: [French] in cycling, the rainbow colors of the world champion's jersey. arcobaleno: [Italian] in cycling, the rainbow colors of the world champion's jersey. arrêté: [French] standing start, in track racing, usually beginning a time trial. attack: to accelerate or break away from other cyclists. audax: special touring events with checkpoints. axle: central fitting for bearings in hubs and bottom brackets; also Achsschenkel [German]. azzurri, squadra azzurra: [Italian] blue team; members of the Italian National sports team. ball bearing: hard round spheres, usually steel, set in series between two bearing races with cups and cones, or in a sealed cartridge bearing, ranging from 1/4 to 5/32 inch. bail: 1. to jump off a bike before crashing. 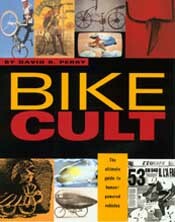 2. to quit a ride or race; also abandon. balai: [French] last vehicle in race caravan for cyclists who abandon on course. balance: a name given to high-wheel bicycle. balustrade: the outer limit of a cycle track, consisting of a solid, closed low wall and a railing. baroudeur: [French] a cyclist capable of high speeds on flat and rolling roads and in time trials; also rouleur. base: in training, a preparatory period usually consisting of long hours of riding; also base miles, base work. basket case: [slang] a name for a person or bicycle with a basket. beater: an old well-worn bicycle, an additional bike for rugged use. beef it: to fall or crash. bicycle-friendly: people and places that accommodate cycling. biff: to fall or crash. bike-a-thon: fund-raising bike tour based on donations pledged according to the amount of miles cycled. bike boom: historic period of cycling popularity beginning around 1970.
bike pollution: [Japan] clutter of bikes parked at train stations. biopacing: arrhythmic or bouncing pedaling, caused by elliptical chainrings (attributed to Shimano Biopace chainrings) or suspension systems on bikes; also pogoing. block: 1. to slow or disrupt the progress of another cyclist, to disrupt the chase of a breakaway. 2. a cassette or multi-speed freewheel. BMX: bicycle moto-cross, racing on short dirt tracks. boing, boing-boing: a bike with front and/or rear suspension. bonification: time bonus awarded to winner of race in stage race, usually five to ten seconds subtracted. bonk: to run out of energy; to exhaust stored glycogen. boneshaker: name given to velocipede and its bone-shaking ride. boxed (in): to be trapped in a group of riders, unable to move forward or sideway. break, breakaway: one or more cyclists leading and separated from the main group. bridge: to cross from one group of cyclists to a group ahead; to bridge a gap. brodie: to brake and skid the rear wheel so as to make a sharp turn; also broadie [Australian]. broom wagon: a support vehicle in a ride or race that follows last rider or group on the course; vehicle that picks-up abandoned riders; also voiture balai. bunch: main group of cyclists; also field, pack, or peloton. bunny hop: to lift both wheels off the ground. cadence: rate of pedaling measured in revolutions per minute. camber: the angled or beveled cross-section of a road, path or track, usually designed for drainage; off-camber curves slope away from apex and push cyclists' momentum outside of turn. campy: knickname for Campagnolo [Italian] a manufacturer of bicycle racing components; also Campag. captain: front steering cyclist on a tandem. carve: to cut a fast line through a turn; to cut a groove in dirt while turning. carbo loading: method of increasing energy supply for specific athletic events. cat, category (1, 2, 3, 4, 5): 1. a ranking system for cyclists in amateur racing, from elite (Cat 1) to beginner (Cat 5). 2. a ranking system for hills and mountains based on difficulty, from cat 1 (more severe) to cat 4 (less severe). century: a one-hundred-mile ride (161 kilometers); metric century is one hundered kilometers (62 miles). chaingang: a group of cyclists, club riders, who meet for training sessions, usually in pacelines. chainring tatoo: greasy marks or bloody gouges made by chainrings on a cyclist's lower leg or pant; also rookie mark. chainsuck: when the chain gets jammed between frame and chainrings. chamois: padding in shorts to prevent saddlesores, traditionally derived from goat skin. chase: in racing, an individual or group in pursuit of a leading breakaway. CKD: completely knocked down, disassembled bike for shipping. classic: 1. a cycling event with a long history, usually more than a few years. 2. the oldest European professional road races, including Het Volk, Milan-San Remo, Tour of Flanders, Paris-Roubaix, Liege-Bastogne-Liege, Amstel Gold, Paris-Tours, and Tour of Lombardy. 3. a vintage, collectable bicycle that represents a type and time period, including American cruiser bikes, Italian racing bikes, and French touring bikes, among others. clincher: tire with separate tube, fits to rim by beaded belt; also wire-on. clipless: a type of pedal, without toe clips, that has a built-in shoe-cleat retaining system. club ride: group rides formed by cycling clubs for regular, dedicated touring and training, usually categorized by speed and distance (i.e. A+, B-, C+). club rider is usually an experienced cyclist. clunker: 1. an old, well-used beater bike. 2. an original ballon-tire cruiser bike converted for all-terrain clunking, or mountain biking; also klunker. coast: to glide while not pedaling but moving forward as on a coaster-brake bike; also freewheeling. contre la montre (CLM): [French] against the clock; a time trial race in which individuals or teams against the clock, as opposed to a massed-start head-to-head race. copsicle: a police officer on a bicycle. côte d'azur: [French] blue coast; a light blue band on the inside of the cycle track, serving to access the track surface, not of the official cycling surface. countersteer: a method of turning or changing cornering angle to prevent a skid, slide, or crash, quick steering in opposite direction of turn. criterium: [French: judgement; a multi-lap bike race on a short course; also circuit race. critical mass: group ride for cyclists' solidarity, usually in traffic. cross frame: bike frame design with down tube and chain stays crossed by seat tube. cycle path: road or trail dedicated for cycling, often shared with pedestrians, joggers, skaters, equestrians, etc. ; also bikeway, bike path, cycleway and veloway. cycletouring: touring by cycle; bicycle camping with camping gear and luggage, or credit card touring with little or no luggage. cycle track: the cycling surface itself, including subconstructions, from inside côte d'azur to outside balustrade. cyclo-cross: 1. a type of off-raod racing, similar to steeplechase, with a short multi-lap course combining cycling and running. 2. a cyclo-cross bicycle, designed for cyclo-racing and touring. dab: to briefly put a foot down to catch one's balance. dance (on pedals): to ride out of saddle, usually on hill climb, with a quick cadence. death march: a ride that is longer and harder than expected; also a three-hour tour (from theme song of Gilligan's Island. development: [French] 1. gear measurement in meters, the distance traveled in one cycle or revolution of pedals; also roll-out. dialed (in): a bike that is set up and working nicely. dicycle: (1881) a two-track bicycle. diamond frame: common bike frame design forming a diamond shape. differential: gear system for axle with two drive wheels, allows proper turning. digging (a pedal): a cyclist hitting a pedal on the ground while leaning in a turn. directeur sportif: [French] race team manager or coach. dishrack: bike parking rack with slots for wheels. derny: 1. motorpaced race on track or raod course. 2. a special motorcycle used to pace cyclist. D-lock: commonly used d-shaped bike lock; same as u-lock. domestique: [French] servant; team rider who sacrifices individual ambition to assist team leaders. DNF: did not finish; a cyclist who abandons a race. dossard: [French] competitor's race number. drafting: riding behind another cyclist or vehicle for aerodynamic advantage. drift: turning or sliding sideways, as a result of entering a corner too fast with wrong line. drop, dropped: failing to keep pace, loosing contact with the main group of cyclists. drop anchor: 1. slower riding on steep hill. 2. in cycletouring, stopping to set camp. drops: the lower part of the handlebars, usually below the brake levers. duathlon: running and cycling event; also called biathlon. eat it: to fall or crash. echelon: a paceline of drafting cyclists grouped in two staggered lines, one moving forward into wind, the other moving backward sheltered downwind by the others. endo: (end over end) a front flip over the handlebars; also a front wheelie with the rear wheel off the ground. ergometer: device that measures human power output. étape: [French] single stage of a multi-stage race. face plant: to fall on one's face. factor of safety: measurement of materials' strength for bike components. fairing: a part of bicycle designed to shelter the cyclist from wind or wet, often used to reduce wind drag in human-powered vehicle competition. false flat: a difficult uphill section of road or trail that would appear to be an easier level gradient. false start: an unofficial start of a race, usually re-started because someone jumped the gun; also mis-start. fat tire: name for a mountain bike, with wider tires than those of road and touring bikes. feed zone: location on race course where cyclists receive food or drink offered by support crew. field: whole or main group of cyclists. field sprint: sprint at finish with main group of cyclists. fixed gear: a type of bicycle with direct drive, no coasting or freewheeling. flamme rouge: [French] red triangular sign marking the final kilometer of a road race. flyer: 1. short breakaway, an acceleration ahead of a group of cyclists. 2. to fall. flywheel: a heavy wheel that can store and supply energy, from the inertia of its spinning mass, usually used on stationary exercise bikes. FOB: freight on board, bike's cost at port of origin. funny bike: name given to aerodynamic bikes made in 1980s. gear inches: a relative measure of bicycle transmission, gear ratio times wheel diameter; see development. general classification, GC: overall standings in a stage race, based on accumulated time of each stage, rider with lowest time leads the GC. gnarly: anything rough or treacherous. Golden Age, bicycle craze: historic period in 1890s when bicycles were extremely popular. gonzo: anything fun, crazy, extreme, or cool. gradient: steepness of road or trail, measured in percentage; 100 meter rise in one kilometer = 10% gradient. grand tour: one of the highest ranked national stage races, ranked hors category (beyond category), three-week competitions including Tour de France, Giro d'Italia, and Vuelta a Espana. granny gear: very low gear, usually near one-to-one ratio, used for steep hills and carrying loads. gravy dog: a bike messenger who makes high-paid deliveries. grupetto: small group of riders, usually left behind the leaders and main group on a climb, riding slow as possible within stage race time limit. grunt: a hardened cyclist; also a very difficult climb. gruppo: [Italian] group of bike components, including hubs, gears, cranks, brakes, etc., usually of the same model and make. hammer: to pound the pedals, accelerate and ride as fast as possible, as in "put the hammer down." handicap: a race start in which riders begin in a staggered line or at different times, based on each riders competitive ranking, making an fair and exciting race with the slower ones starting first and faster ones in pursuit. handsling: an exchange or relay of a teammate in a madison or "american" track race, in which one teammate (that rested for a lap or two) begins accelerating to link hands of exhausted teammate and get slingshot into race. hanging in: keeping pace with a group of cyclists, not leading, usually to save energy or because of fatigue. hardtail: a bike without rear suspension, usually a mountain bike with front shocks and a solid rear end. header: falling on one's head, to "take a header." headwind: a primary resistance that limits the speed of cycling; measured as the speed of wind (the air pressure) that hits a cyclist in a frontal position, in the face, see sidewind. heart rate, HR, bpm: heart beats per minute. high-wheel, high-wheelers: type of bicycle, and the cyclists who rode them, first made in the 1870s, designed with a big wheel (over 40-inch diameter) to pedal a big gear, and a small wheel (under 20-inch) for steering; first made in the 1870s; also named ordinary, penny farthing, grand-bi, hoge-bi, Hochrad. honk: acceleration by standing on pedals, out of the saddle, pulling on handlebars, moving the bike side to side. hook: elbowing or wheel movement which impedes the progress of another cyclist, usually illegal. horizontal track stand: a failed track stand, a fall caused by a stopped cyclist unable to disengage a foot from its pedal. horsepower, hp: measure of power output, one hp equals 746 watts. hydroplaning: riding on the surface of water, when tires skim on wet road. intermodal: transport system that allows for different modes, e.g., in U.S., ISTEA (1992) grants funds for bike and transit. ISO: International Standards Organization; group that sets world standards for bicycle materials, component sizes and threadings. jersey: shirt or pullover worn by cyclists. jump: a quick acceleration that may develop into a breakaway or sprint, usually standing on the pedals out of saddle. kermesse: a circuit road race with laps of about three to ten kilometers, popular in Belgium and Holland. keirin: (say Kay-rin) a track race led by a pacer on bike or motorcycle that develops into massed sprint; a UCI world championship event and parimutuel-style of bicycle racing in Japan; see NJS. kick: a sudden acceleration, that may be at the beginning or end of a sprint, as in finishing kick. kickout: the controlled or out-of-control sliding or lifting movement of a rear wheel in a corner, usually mountain biking. kinetic sculpture: mobile art works, human-powered vehicles. klunker: 1. old, well-used bike suitable for rough use; also clunker, beater, trasher. 2. A cyclist who rides in a rough, playful, or destructive manner; klunking. knobby: tire tread with studs for off-road traction; as a pair of knobbies. lap, lapped: the distance of one complete loop of a track or a circuit course; to be lapped is to lose a whole lap, "taking a lap" is to gain a lap. laughing group: a group of cyclists far behind the leaders, usually the last group, or grupetto. leadout: tactic where team rider accelerates to maximum speed so leader can draft and sprint past, see slingshot. lantern rouge: [French] red tail light on train's caboose, last finisher in a race, last in general classification. license (Trailer, Bus, Ambulance): among racers, symbolic license earned by competing in a grand tour. Trailer License for Tour de France because racers are pulled along, Bus License for Giro d'Italia becasue racers are grouped until finish, Ambulance License for Vuelta a Espana becasue racers are exhausted at end of season. loafing: tactic of slow riding in preparation of a sprint, also jockeying, waiting game. low rider: 1. recumbent bike or HPV with ultra-low position for aerodynamics. 2. classic bike with ultra-low position for show. madison: an endurance track race in which teams of two riders relay one another, one in the fray the other resting, usually a massed-start points race, often within a six-day race; named for its origin in Madison Square Garden in 1890s; also l'american. maglia rosa: [Italian] race leader's pink jersey for Giro d'Italia. maillot jaune: [French] race leader's yellow jersey, usually for Tour de France. massed start: a race start in which riders begin together at same time and compete head-to-head. mechanical: a problem with the mechanical function of a bicycle, often causing a cyclist to lose a race. mini-bike: [British] a small-wheel bicycle; [American] a small moped; [Japanese] a moped. minuteman: cyclist preceding another in a time trial, usually by a minute or two. modal split: the ratio or percent that different modes of travel are used. monocycle: one-wheel cycle, with cyclist inside wheel; also unicycle, with cyclist on top of wheel. motorhead: selfish motorist; a auto-centric system of values that manifests on the road and in the world at-large, that excludes and endangers cyclists. motorpace: riding in the draft of a motorcycle, car, van, or sometimes another cyclist. mud diving: when a cyclist is stopped by, and thrown into, thick mud. musette: [French] cloth shoulder bag for carrying food and drinks, usually handed off to racers in feed zone. NJS: [Japanese] Nihon Jitensha Shinkokai; Japan keirin cycling organization, promotes parimutuel-style bicycle track racing. neutral: 1. neutral support is mechanical help given by fair and neutral party; neutral zone is non-racing section of course, usually starting "parade laps;" neutralization occurs in special sitautions of rail crossings or mass crashes, in which riders must slow and maintain their relative positions. OEM: original equipment manufacturer, maker of parts for name brand bikes. off the back: getting, dropped, where cyclists find themselves after failing to keep pace. omnium: track meet with a variety of races. overuse injury: ailment due to hard training or improper gearing. pace: average speed; to set the pace at the front of pack; also tempo, cruising speed. paceline: chain-like formation of cyclists sharing the pace by taking turns at lead breaking the wind, then pulling aside and soft pedaling to the sheltered rear position for recuperation, see drafting, echelon. pack: a close-knit group of cyclists, or peloton. palmares: [French] a list of honors, noting a cyclist's career winnings, placings and awards. pannier: [French, bread basket] bike-mounted storage bags. pavé: [French] cobblestone road surface. pedicab: cycle rickshaw or pedal-powered taxi. peloton: the whole or main group of cyclists; also pack, field, bunch. penny farthing: a high-wheel bicycle, a name that derives from wheel size, the large front wheel being a penny, the tiny rear wheel a farthing. pits, pit stop: designated location on race course where cyclists can receive equipment repairs. pixie gear: a very low gear ratio, one to one or less; also granny gear and weenie gear. pole line: the inner line on a bicycle track that measures the distance of a lap. pole position: 1. inner lane of bicycle track bound by pole line and sprinter's line. 2. front line starting place in massed-start race, rear line starting place in handicap race. power: measure of the rate of energy transformation needed to move a body in time and space, as in force times distance divided by time, in watts and horsepower. powerslide: a two-wheeled sideways slide, usually with one foot on the ground. presta valve: air valve commonly used on high-pressure tubes and tubular tires. prime: (say preem) mid-race sprint for prize, points, or time bonuses. prologue: [French] beginning of stage race, usually a time trial, may not count in general classification. pull: to ride at the front of a group in the wind, taking a pull, as in an echelon or paceline. push: pedaling with a large gear. pushbike: [British] a pedal cycle as opposed to a motor cycle. pushclimb: a very steep or unrideable section of road or trail that forces a cyclist to dismount and walk with bike. RAAM, Race Across America: transcontinental ultra-marathon 3,000 mile round-the-clock bike race. raid: semi-competitive touring event, usually held on rugged terrain. rail: to ride fast and smooth through a corner. rainbow jersey: jersey awarded to winners of annual UCI World Championship events, with colored bands in blue, red, black, yellow and green. rando, randonneur, randonnee: [French] special touring event with checkpoints. recumbent bike: type of bicycle with a seated cycling position. relay: events with cyclists exchanging places with teammates, to share the workload, e.g., a handsling in a madison race. repechage: [French] second chance; a round in a track racing series that allows a second chance for losers of early qualifying heats. retro-grouch: someone who insists on tradition. road rash: skin abrasions due to fall or crash. rocket fuel: a high-energy food or drink. rouleur: [French] a cyclist capable of high speeds on flat and rolling roads and time trials; also baroudeur. saddlesores: painful abrasions, pimples, blisters, and swollen hair follicles that often occur around the sit bones of a cyclist's crotch. saddle time: time spent actually riding. safety bike: common bike design, dating from 1880s, with upright position. sag wagon, broom wagon: motor vehicle following cyclists in tours or races that carry equipment, clothes, food, medical supplies, and tired or injured cyclists. schraeder valve: air valve commonly used on low-pressure tubes and car tires. scorcher: name given to fast cyclists of the 1890s. sew-up: tubular tire with casing sewn around inner tube. shake `n bake, whiplash: an evasive racing technique where a lead cyclist swerves across road to drop drafting cyclists. singletrack: a trail wide enough for one person, usually five feet wide or less. sitting in, sitting on: sitting in another cyclist's slipstream to save energy, see hanging in. six-day race: week-long track race with daily and nightly events. skid lid: a cyclist's helmet. slingshot: using another cyclist's slipstream to gain speed and sprint past, see leadout. slipstream: wind shelter provided by leading cyclist or group. snakebite: one or two tiny punctures in a tube, usually caused by under-inflated tires and/or hitting a hard object. snap: muscular speed used to accelerate quickly. snerd: one who sniffs bicycle seats. softpedal: half coasting, half pedaling, turning the pedals with minimal force to save energy. soigneur: [French] racer's attendant, taking care of food and massage. solo: bicycle built for one, as opposed to tandem. souplesse: supple or loose muscles. spin: pedaling at a rapid cadence. spoke poker: game of finding cards in the street, putting them in your spokes, and someday hopefully finding a poker hand. spuds: clipless pedals, usually Shimano SPD-compatible. squirrel: a swerving, unstable, nervous cyclist. stage race: a multi-day point-to-point race, usually with road races, time trials, and criteriums. stayer: 1. type of bike and motorcycle used for paced racing. 2. cyclist with the ability to maintain a high speed for long periods, usually on flat roads; also pacer or rouleur. stoker: rear cyclist on a tandem. straight: two straight sections of a cycle track, e.g., home straight is straight where the finish line is situated, back straight is straight opposite the home straight. surplace: [French] technique of balancing in place, motionless on a bike; also called trackstand. swag: equipment, accessories, or clothing found along the road or trail; also freebies offered at bike shows and events. sweet spot: special moment of euphoria brought on by cycling. switchback: one of many sharp turns in roads that go up steep mountains. taco: a wheel bent into a half circle. tandem: bicycle built for two, usually both pedaling. team time trial, TTT: in racing, a time trial on road or track, usually with four-person teams. technical: a course, usually off-road, that requires special bike-handling skills. techno-weenie: someone who likes technology. tempo: moderately high rate of cadence or speed; also cruising speed. throwing the bike: technique of pushing the bike forward in a close sprint so the front wheel crosses the finish line first. tifosi: [Italian] super-enthusiastic bike racing fans; derives from typhus patients suffering from fever and delirium. time trial, TT: an individual, unpaced race against the clock over a specific distance. topo map: topographical map showing elevations, see gradient. track bike: special type of simple, lightweight bike designed for track racing, usually with fixed-gear transmission. trail: 1. off-road path. 2. measurement of steering geometry, distance that vertical line from wheel axle falls behind line from steering tube. trailhead: entry point of off-road trail. trial: any kind of cycling test, stunt, or race. triplet: bicycle built for three. tuck: extremely aerodynamic position used for descending and time trials. turkey: a slow, awkward, or novice cyclist. turn: a curve or bend section of a cycle track, e.g., two 180 degree turns, or four 90 degree turns in direction in one lap of a cycle track. turn sheet: route map indicating turns, stops, stores and landmarks. tweak, tweek: to turn, bend, or break something. u-lock: commonly used u-shaped bike lock. unicycle: one-wheel cycle, with the cyclist above wheel. unobtanium: bike equipment made from expensive, hi-tech material. velocipede: [French] (1817) 1. a lightweight wheeled vehicle propelled by the rider. 2. a bicycle with pedal cranks fixed to the driving wheel; see boneshaker. velodrome: a venue in which a cycle track is installed for cycle racing, including infield, safety area, tunnel or bridge, grandstands, changing rooms, etc. veloway: a bike path with few intersections. wannabe: a cyclist who wants to be better but is somehow lacking. washboard: a rough riding surface that has small bumps or undulations. wheelbase: distance from front to rear wheel axles; influences a bike's steering. wheelie: to ride with the front wheel off the ground; to "pop a wheelie." wheelspray: dirty rainwater that sprays off fenderless wheels (as on race bikes) into other cyclists' eyes, faces, arms, and legs. wheelsucker: a cyclist who does no work in a paceline or peloton. wicking: function of clothing material. wind-up: gradual acceleration leading up to an all-out sprint. wonk: any person or bike that does not function properly. work: measure of the energy needed to move a weight a distance, as in force times distance, in foot-pounds, newtons, or ergs. XC: cross-country mountain bike race. atmosphere: = 14.7 pounds per square inch. British thermal unit (BTU): = 1,054.9 joules. centimeter (cm): = 10 millimeters = 0.39 inches. cup (c): = 8 fluid ounces. day (d): = 24 hours = 1440 minutes = 86400 seconds. degree Fahrenheit: = 1.8 degree Celsius. fluid ounce (fl oz): = 29.6 milliliters. foot (ft): = 12 inches = 30.5 centimeters. foot-pound (lb-ft): = 1.356 joules. foot-pound per second (ft-lb/sec): = 1.356 watts. gallon (gal): = 4 quarts = 3.78 liters = 231 cubic inches = 8.34 pounds of water. gram (g): = 0.03 ounces. horsepower (hp): = 745.7 watts. hour (h) = 60 minutes = 360 seconds. inch (in): = 2.54 centimeters. joule (J): = 0.7375 foot-pounds = 107 ergs. kilocalorie (kcal): = 1 nutritional calorie = 1,000 physics calories = 4,186.8 joules. kilocalorie per minute (kcal/min): = 69.78 watts. kilogram (kg): = 1000 grams = 2.205 pounds. kilometer (km): = 1,000 meters = 0.6214 miles. kilometer per hour (kph): = 0.62 miles per hour. kilowatt hour (kWh): = 3.6 megajoules. knot (nm): = 1.15 miles = 1.85 kilometers. knots (nautical mph): = 0.52 meters per second. liter (l): = 1.06 quarts. meter (m): = 100 centimeters = 3.28 feet. meter per second (m/s): = 3.6 kilometers per hour = 2.237 miles per hour. mile (mi): = 5,280 feet = 1.609 kilometers. mile per hour (mph): = 1.609 kilometers per hour = 0.447 meters per second. milliliter (ml): = 0.001 liters. millimeter (mm): = 0.039 inches. minute (min): = 60 seconds. ounce (oz): = 28.3 grams. pound (lb): = 16 ounces = 0.45 kilograms. quart (qt): = 4 cups = 0.94 liters. second (sec): = 1,000 milliseconds. ton (t): = 2,000 pounds = 900 kilograms. watt (W): = 1 joule per second. yard (yd): = 3 feet = 0.914 meters.